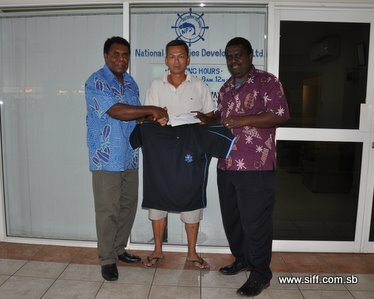 Several business houses including Lee Kwok Kuen and the National Fisheries Development (NFD) agency have come forward to donate merchandise to the teams as they prepare to leave for the Pacific Games. They join the ranks of Our Telekom and others who donated t-shirts and other forms of assistance last week. This morning it was the turn of the Central Bank of Solomon Islands (CBSI) which donated 50 t-shirts and $3000 to assist both national teams. Their presentation was conducted at the Allan Boso complex by the CBSI manager for corporate services, John Bosco. In handing over CBSI’s assistance Bosco says that CBSI is pleased to assist the national teams and wished them well at the Pacific Games. “Our donation to the national teams is part of our corporate support for sports teams that are heading to the Pacific Games. Sports unites and CBSI is always willing to support its growth in the country,” Bosco says. “On behalf of the management and staff of CBSI I would also like to take this opportunity to wish our national football teams all the best at the Pacific Games and hope that they perform well and win medals for Solomon Islands,” Bosco adds. Yesterday the Bonitos received 25 polo shirts from the National Fisheries Development (NFD) agency plus a cash donation of $2500 presented at their headquarters at the Panatina Plaza. Manager of NFD, Adrian Wickham, who is incidentally a former president of SIFF, says his organisation is proud to assist the Bonitos. “We are honoured to be able to assist our national team and we would like to wish the team all the best at the Pacific Games,” Wickham says. Lee Kwok Kuen yesterday donated 30 training shirts to the women’s team while the Dragons Social Football Club organised a farewell dinner for them at the Ranadi Beach Club. General Secretary of the Solomon Islands Football Federation (SIFF), Eddie Ngava, thanked the business houses and organisations who have supported the teams saying that this assistance is an important morale booster for the players. “The support from these local organisations indicates their confidence in our national football teams. It is positive for the players and I wish to thank everyone who has lent a hand to our representatives,” Ngava says. Both national teams will be leaving for New Caledonia at 9:00am tomorrow.